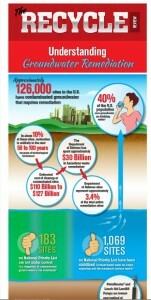 Did you know that about 40% of the US population uses groundwater as drinking water? Unfortunately, there are still roughly 126,200 sites in the US that contain contaminated groundwater and require remediation. Groundwater remediation is the process of removing pollution from our water supplies and fresh drinking water sources. This process can be costly and range from $110-127 billion. However, with the use of Abanaki’s PetroXtractor oil skimmers and leachate pumps, that cost can drop drastically. Our products are designed to work in rugged and harsh environments. Additionally, they require little power or energy to operate, helping to reduce energy costs of the end user. Learn more about the facts of contaminated groundwater sites in the US and how Abanaki PetroXtractor belt oil skimmers and pumps can easily and efficiently remediate your contaminated ground water. Click the image of our new infographic below to learn more about Groundwater Remediation and our wide range of useful products!